Wow! Yesterday was amazing! I can't remember the last time I was gone ALL DAY... or if I ever was. Long hours. 9am - 10pm. But is was worth it. 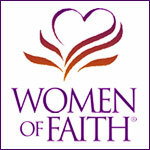 I love all the speakers at the Women of Faith conference. Such wonderful people with hearts for God. I love hearing Sheila Walsh. She has a way of sharing her story that keeps you wanting more. I could listen to her speak all day. Marcus Buckingham was great. What a pleasure it was to hear all he had to say. Valuable information told with such humor and delight. Lisa Harper was so refreshing. So real. She can have you laughing until you cry... or just crying with her as she shares her life story. An amazing woman... loved her. And Natalie Grant... Have you heard her sing? I don't mean her songs on the radio... I mean just listening to her sing live, in person. What a gift! She has every right to be out in the world boasting of her gift along with the best of them! But she's not. She uses her gift to glorify God and when she sings her love for Him shines through a humble heart. Did I say yesterday was amazing??? Well, I was right! So I'm off for another day of Women of Faith. Only 9am-5pm today. Sooo excited!